This article is about the All-Star basketball player. For the 1980s player, see Devin Durrant. For the actor, see Kevin Durand. Durant was a heavily recruited high school prospect who was widely regarded as the second-best player in his class. In college, he won numerous year-end awards and became the first freshman to be named Naismith College Player of the Year. As a professional, he has won two NBA championships, an NBA Most Valuable Player Award, two Finals MVP Awards, two NBA All-Star Game Most Valuable Player Awards, four NBA scoring titles, the NBA Rookie of the Year Award, and two Olympic gold medals. Durant has also been selected to eight All-NBA teams and ten NBA All-Star teams. Off the court, Durant is one of the highest-earning basketball players in the world, due in part to endorsement deals with companies such as Foot Locker and Nike. He has developed a reputation for philanthropy and regularly leads the league in All-Star votes and jersey sales. In recent years, he has contributed to The Players' Tribune as both a photographer and writer. In 2012, he ventured into acting, appearing in the film Thunderstruck. Durant was born on September 29, 1988, in Washington, D.C., to Wanda (née Durant) and Wayne Pratt. When Durant was an infant, his father deserted the family; Wanda and Wayne eventually divorced, and Durant's grandmother Barbara Davis helped raise him. By age 13, his father reentered his life and traveled the country with him to basketball tournaments. Durant has a sister, Brianna, and two brothers, Tony and Rayvonne. Durant and his siblings grew up in Prince George's County, Maryland, on the eastern outskirts of Washington, D.C. He was unusually tall from a young age, and reached 6 ft 0 in (1.83 m) in height while still in middle school (age 13–14). Growing up, Durant wanted to play for his favorite team, the Toronto Raptors, which included his favorite player, Vince Carter. He played Amateur Athletic Union (AAU) basketball for several teams in the Maryland area and was teammates with future NBA players Michael Beasley, Greivis Vásquez, and Ty Lawson, the first of whom Durant remains friends with to this day. During this time, he began wearing #35 as his jersey number in honor of his AAU coach, Charles Craig, who was murdered at the age of 35. After playing two years of high school basketball at National Christian Academy and one year at Oak Hill Academy, Durant transferred to Montrose Christian School for his senior year, growing 5 inches (13 cm) before the start of the season and beginning the year at 6 ft 7 in (2.01 m). Prior to the start of the season, he committed to the University of Texas. At the end of the year, he was named the Washington Post All-Met Basketball Player of the Year, as well as the Most Valuable Player of the 2006 McDonald's All-American Game. He was widely regarded as the second-best high school prospect of 2006. 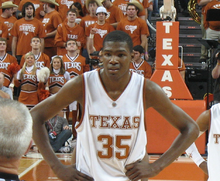 For the 2006–07 college season, Durant—who had grown to 6 ft 9 in (2.06 m)—averaged 25.8 points, 11.1 rebounds, and 1.3 assists per game for the Texas Longhorns as a student at the University of Texas. The Longhorns finished the year with a 25–10 record overall and a 12–4 record in conference. Awarded a fourth seed in the NCAA Tournament, Texas won their first round match-up against New Mexico State but were upset in the second round by USC despite a 30-point and 9-rebound performance from Durant. For his outstanding play, Durant was recognized as the unanimous national player of the year, winning the John R. Wooden Award, the Naismith College Player of the Year Award, and all eight other widely recognized honors and awards. This made Durant the first freshman to win any of the national player of the year awards. On April 11, he officially declared for the NBA draft. His #35 jersey was later retired by the Longhorns. Durant was selected as the second overall pick in the 2007 NBA draft by the Seattle SuperSonics. In his first regular season game, the 19-year-old Durant registered 18 points, 5 rebounds, and 3 steals against the Denver Nuggets. On November 16, he made the first game-winning shot of his career in a game against the Atlanta Hawks. At the conclusion of the season, he was named the NBA Rookie of the Year behind averages of 20.3 points, 4.4 rebounds, and 2.4 assists per game. He joined Carmelo Anthony and LeBron James as the only teenagers in league history to average at least 20 points per game over an entire season. Following Durant's debut season, the SuperSonics relocated from Seattle to Oklahoma City, becoming the Thunder and switching to new colors – blue, orange, and yellow. The team also drafted UCLA guard Russell Westbrook, who would form an All-Star combination with Durant in later years. At the 2009 NBA All-Star Weekend, Durant set a Rookie Challenge record with 46 points. By the conclusion of the year, he had raised his scoring average by five points from the prior season to 25.3 points per game, and was considered a strong candidate for the Most Improved Player Award, eventually finishing third in the voting. Durant continued to grow during his first few years in the NBA, finally reaching a height of 6 ft 11 in (2.11 m). During the 2009–10 season, Durant was selected to his first NBA All-Star Game. Behind his play, the Thunder improved their record by 27 wins from the previous year and defied expectations to make the playoffs. With a scoring average of 30.1 points per game, he became the youngest NBA scoring champion and was selected to his first All-NBA team. In his playoff debut, he scored 24 points in a Game 1 loss against the Los Angeles Lakers. Oklahoma City would go on to lose the series in six games, but the team's performance led many analysts to label them as an upcoming title contender. Prior to the start of the 2010–11 season, Durant announced via Twitter that he had signed a five-year contract extension with the Thunder worth approximately $86 million. For the second consecutive year, he led the NBA in scoring, averaging 27.7 points a game. Behind his leadership, the Thunder won 55 games and earned the fourth seed in the Western Conference. In the playoffs, Oklahoma City defeated the Denver Nuggets and Memphis Grizzlies en route to a Conference Finals match-up versus the Dallas Mavericks, losing in five games. On February 19 of the lockout-shortened 2011–12 season, Durant recorded his first career 50-point game, scoring 51 points against the Denver Nuggets. At the All-Star Game, he scored 36 points and was awarded the NBA All-Star Game Most Valuable Player Award. He finished the year with a scoring average of 28 points per game, representing his third straight scoring title. Behind his play, the Thunder won 47 games and entered the playoffs as the Western Conference's second seed. In Game 1 of the first round against the Mavericks, Durant hit a game-winner with 1.5 seconds remaining. Oklahoma City would go on to defeat Dallas, the Lakers, and the San Antonio Spurs before losing to the Miami Heat in the Finals. For the NBA Finals, Durant led all players with 30.6 points per game, doing so on a 54.8 shooting rate. With a scoring average of 28.1 points per game to finish the 2012–13 season, Durant failed to defend his scoring title; however, with a 51 percent shooting rate, a 41.6 percent three point shooting rate, and a 90.5 free throw shooting rate, he became the youngest player in NBA history to join the 50–40–90 club. Finishing the year with a 60–22 record, Oklahoma City earned the first seed in the Western Conference. In the first round of the playoffs against the Houston Rockets, Russell Westbrook tore his meniscus, forcing him to miss the remainder of the postseason. Without Westbrook, Durant was given more responsibility, averaging a career-high 30.8 points per game throughout the playoffs, but Oklahoma City were eventually eliminated in the second round by the Memphis Grizzlies in five games. In January of the 2013–14 season, Durant averaged 35.9 points per game while scoring 30 or more points in 12 straight games, including a career-high 54 points against the Golden State Warriors. In April, he surpassed Michael Jordan's record for consecutive games scoring 25 points or more at 41. The Thunder finished the year with 59 wins and Durant was voted the NBA Most Valuable Player behind averages of 32 points, 7.4 rebounds, and 5.5 assists per game. To begin the first round of the playoffs, he struggled against the physical play of the Grizzlies, converting on only 24 percent of his field goals in Game 4. Through six games, the Thunder trailed the series 3–2, prompting The Oklahoman to dub Durant "Mr. Unreliable". He responded by scoring 36 points in a Game 6 victory. Oklahoma City eventually eliminated Memphis and the Los Angeles Clippers before losing to the Spurs in the Conference Finals in six games. Prior to the start of the 2014–15 season, Durant was diagnosed with a Jones fracture in his right foot and was ruled out for six to eight weeks. He subsequently missed the first 17 games of the year, making his season debut for the Thunder on December 2 against the New Orleans Pelicans. On December 18, he injured his ankle against the Golden State Warriors, returning to action on December 31 against the Phoenix Suns to score a season-high 44 points. He then sprained his left big toe in late January. On February 22, he was sidelined again after undergoing a minor procedure to help reduce pain and discomfort in his surgically repaired right foot, and on March 27, he was officially ruled out for the rest of the season after deciding to undergo foot surgery. In just 27 games, he averaged 25.4 points, 6.6 rebounds, and 4.1 assists per game. To begin the 2015–16 season, Durant and Russell Westbrook reached several historical milestones together, including becoming the first pair of teammates to each score at least 40 points in a single game since 1996, doing so in a win over the Orlando Magic on October 30. On April 11, Durant scored 34 points against the Lakers, setting an NBA record for consecutive games scoring 20 or more points with 64. For the year, Durant averaged 28.2 points, 8.2 rebounds, 5 assists, and 1.2 blocks per game, leading the Thunder to 55 wins and the third seed in the West. In Game 2 of the first round of the playoffs against the Mavericks, he scored 21 points but converted only 7 out of 33 shots in the worst postseason shooting performance, both by percentage and number of misses, of his career. After defeating Dallas, Oklahoma City moved on to face the Spurs in the second round, falling behind 2–1 to start the series. In Game 4, Durant tied his playoff career high with 41 points in a Thunder win. Oklahoma City eventually defeated the Spurs in six games, drawing a matchup with the record-setting 73-win Golden State Warriors in the Conference Finals. Despite going up 3–1, the Thunder were ousted in seven games, with Durant providing 27 points in Game 7. On July 4, Durant announced his intentions to sign with the Warriors in The Players' Tribune. The move was received negatively by the public and NBA analysts, with many comparing it to LeBron James's 2010 off-season departure from the Cleveland Cavaliers to join the Heat. On July 7, Durant officially signed with Golden State on a two-year, $54.3 million contract with a player option after the first year. Reflecting on the move for Sports Illustrated, Ben Golliver wrote, "He chose an ideal roster fit and a shot at playing for the highest-scoring offense the NBA has seen in decades. He chose life alongside Stephen Curry and Klay Thompson, the greatest shooting backcourt in history, and he chose to go against Andre Iguodala and Draymond Green, two elite defenders, in practices rather than in Western Conference finals games." Durant made his debut for the Warriors on October 25 against the San Antonio Spurs, scoring a team-high 27 points in a blowout loss. On November 26, he recorded 28 points, 10 rebounds, five assists, and a career-high six blocked shots in a win over the Minnesota Timberwolves, becoming the first player in team history to finish with at least 25 points, 10 rebounds, five assists, and five blocks in a single game. On February 11, in his first game back in Oklahoma City since leaving for Golden State, Durant scored 34 points while being booed throughout the night as he helped the Warriors defeat the Thunder for the third time that year. In March, Durant suffered a Grade 2 MCL sprain and a tibial bone bruise, which forced him to miss the final 19 games of the season. Golden State finished the year with a 67–15 record and entered the playoffs as the first seed. Durant returned from injury in time for the playoffs and helped the Warriors advance to their third consecutive Finals, while also becoming the first team in league history to start the postseason 12–0. In Game 1 of the series, Durant had 38 points, eight rebounds, and eight assists to lead the Warriors past LeBron James and the defending champion Cleveland Cavaliers. Durant then helped the Warriors go up 3–0 in the series with a 31-point effort in Game 3, including the go-ahead 3-pointer with 45.3 seconds left in regulation. In Game 5, he scored 39 points to go with seven rebounds and five assists in a series-clinching win. For the Finals, Durant was the Golden State's top scorer in every game, averaging 35.2 points, 8.4 rebounds, and 5.4 assists while shooting 55.5 percent from the field, 47.4 percent from three-point range, and 92.7 percent from the free throw line. He was subsequently named the Bill Russell NBA Finals Most Valuable Player. After the Finals, Durant declined his $27.7 million player option and became an unrestricted free agent. On July 25, he re-signed with the Warriors for less money than the maximum, which helped the franchise create enough salary cap space to keep their core roster intact and add free agents. On January 10 of the 2017–18 season, Durant scored 40 points in a loss to the Clippers, becoming the second-youngest player in league history to reach the 20,000-point milestone. On January 23, he registered a career-high 14 assists in a win over the New York Knicks. On February 14, he scored a season-high 50 points in a loss to the Trail Blazers. In March, he missed games with a fractured rib, joining teammates Stephen Curry and Klay Thompson on the sidelines for the back-end of the season. Golden State eventually finished the year with 58 wins and Durant set a career high for blocks in season with 119. In Game 1 of the Western Conference Finals, Durant scored 37 points in a win over the higher-seeded Houston Rockets. Through six games, the Warriors found themselves trailing 3–2, and Durant was criticized for contributing to Golden State's struggles by playing too much in isolation. The Warriors staved off elimination in Game 6, and in Game 7, Durant scored 34 points, helping Golden State return to the Finals with a series-clinching victory. In Game 3 of the Finals, Durant recorded a playoff career-high 43 points, 13 rebounds, and seven assists in a win over the Cavaliers, leading the Warriors to a 3–0 advantage. Golden State ultimately swept Cleveland and clinched a second straight championship; with averages of 28.8 points, 10.8 rebounds, and 7.5 assists, Durant also won his second Finals MVP Award. On July 7, 2018, Durant re-signed with the Warriors. On November 29, 2018, Durant scored a season-high 51 points in a 131–128 overtime loss to the Toronto Raptors, thus scoring 40 or more in his third straight game. With Stephen Curry and Draymond Green sidelined for most of November, the Warriors finished the month with a 15–8 record and five straight road losses, after starting the season at 10–1. In February 2007, Durant received an invitation to the United States national team training camp. Despite a strong performance, he was cut from the team when its roster was trimmed to its twelve-player limit. Coach Mike Krzyzewski cited the experience of the remaining players as the deciding factor in making the cut. Durant was finally selected to the national team at the 2010 FIBA World Championship and became their leader as other All-Stars were unavailable, a role he downplayed. At the tournament, he led Team USA to its first FIBA World Championship since 1994, earning tournament MVP honors in the process. His final averages for the competition were 22.8 points, 6.1 rebounds, 3.1 assists, and 1.4 steals per game in nine games. At the 2012 Olympics, Durant set the record for total points scored in an Olympic basketball tournament. With averages of 19.5 points, 5.8 rebounds, 2.6 assists, and 1.6 steals per game, he helped the national team go undefeated en route to a gold medal. In the tournament's final game, he led all scorers with 30 points. Less than a month before the start of the 2014 FIBA Basketball World Cup, Durant announced that he would be dropping out of the competition, citing mental and physical exhaustion as reasons for his departure. He rejoined Team USA in 2016 for the Olympics, where he led them to a gold medal. In recognition of his performances, Durant was named the 2016 co-USA Basketball Male Athlete of the Year, along with Carmelo Anthony, for the second time in his career. Though Durant's height is officially listed as 6 ft 9 in (2.06 m), he has stated that he actually stands 6 ft 10 3⁄4 in (2.10 m) barefoot and 7 ft 0 in (2.13 m) with shoes. His primary position is small forward and his career averages are 27.1 points, 7.1 rebounds, and 3.9 assists per game. Widely regarded as one of the best players of his generation, Durant has earned All-NBA honors eight times (2009–14, 2016–18) and was voted Rookie of the Year in his debut season. He has also won an MVP Award and finished second in the voting three times, a trend that he has expressed frustration over. Durant is best known for his prodigious scoring ability. From 2010 to 2014, he won four scoring titles, becoming one of only two players to win four scoring titles in a five-year span. Early in his career, his playing style was isolation-driven, but he quickly developed into an excellent off-ball player who was capable of scoring from the outside as well. By 2013, he was shooting at a historically-great clip, which helped him become one of only seven members of the 50–40–90 club. This ability to impact the offense in a variety of ways helped Durant remain effective and improve an already elite offense upon joining the Warriors in 2016. Throughout his career, his height and 7 ft 4 in (2.24 m) wingspan have created matchup problems for defenses as he is able to get off a clean shot regardless of the situation. Upon beating his man or gaining momentum, he also becomes a strong finisher at the rim; for example, he converted 72.2% of shots in the paint in 2012. Early in Durant's career, he was criticized for his slim build, defense, and passing. Over time, he grew as a playmaker, increasing his assist numbers every year from 2010 to 2014, though his overall vision still lagged behind the league's best passers'. He also showed defensive improvement, with opponents averaging just .62 points per isolation play against him in 2014, the best success rate for defensive players who faced at least 100 isolations that season. Upon going to Golden State, he developed into a more reliable off-ball defender and rim protector, and in 2018 was considered for the NBA Defensive Player of the Year Award. 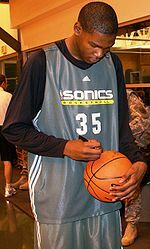 Durant signs an autograph at the SuperSonics' practice facility in January 2008. Durant is very close with his mother, Wanda, a relationship that was detailed in the Lifetime movie The Real MVP: The Wanda Pratt Story. During his time with the Thunder, Durant described himself as a "high school kid" who enjoys playing video games in his spare time. A Christian, Durant has religious tattoos on his stomach, wrist, and back. He owns several properties in the Oklahoma City area and listed his primary residence, located in the affluent Club Villa neighborhood, for sale for $1.95 million in 2013. That same year, he opened a restaurant, KD's Southern Cuisine, in the Bricktown neighborhood and briefly became engaged to Monica Wright, a WNBA player. In 2016, he was a credentialed photographer for The Players' Tribune at Super Bowl 50. Durant was formerly represented by agents Aaron Goodwin and Rob Pelinka. He left Pelinka in 2013 and signed with the Roc Nation group, headed by Jay-Z. Durant has endorsement deals with Nike, Sprint, Gatorade, Panini, General Electric, and 2K Sports. In 2012, he tried his hand at acting, appearing in the children's film Thunderstruck. In 2013, he earned $35 million, making him the fourth-highest-earning basketball player that year. In an interview with Sports Illustrated, Durant claimed that, despite his high earnings potential, "global marketing and all that stuff" does not interest him. One of the most popular players in the league, Durant's jersey regularly ranks as one of the NBA's best-selling and he is consistently one of the top All-Star vote-getters. Early in his career, he developed a reputation for his kind demeanor; in 2013, Foot Locker released a series of commercials calling him the "nicest guy in the NBA", and become a beloved figure in Oklahoma City, known for his "nice escapades" toward the Thunder's staff. In 2014, he partnered with KIND snacks and launched StrongAndKind.com to show "being kind is not a sign of weakness." Since joining the Warriors, he has become more outspoken and controversial; for example, he was involved in a Twitter back-and-forth with C.J. McCollum in July 2018. Durant has admitted to feeling more genuine in Golden State as opposed to Oklahoma City, where he was "just trying to please everybody". Throughout his career, Durant has participated in philanthropic causes. In 2013, he pledged $1 million to the American Red Cross for the victims of the 2013 Moore tornado. His generosity inspired the Thunder and Nike to match his donation. He is also a spokesperson for the Washington, D. C. branch of P'Tones Records, a nationwide non-profit after-school music program. In 2017, Durant became involved with YouTube. In February, he visited YouTube's headquarters for a speaking engagement. On April 7, 2017, he created a YouTube account and soon began to upload live stream vlogs onto it. In his first vlog, he detailed, "I'm so excited because I got off social media. I got off the Instagram, Twitter, all that stuff, just to distance myself a bit. But somebody talked me into getting on the YouTube." As of February 2019, Durant's YouTube channel has received over 700,000 subscribers and 29 million video views. On February 13, 2018, Deadline reported that Durant, in partnership with producer Brian Grazer's Imagine Television, will create a basketball-themed scripted drama for Apple. Cited from Basketball Reference's Kevin Durant page unless noted otherwise. Cited from USA Basketball's Kevin Durant page unless noted otherwise. ^ Durant has stated that he stands 6 ft 10 3⁄4 in (2.10 m) barefoot and 7 ft 0 in (2.13 m) with shoes. ^ a b c Mutoni, Marcel (December 14, 2016). "Kevin Durant Finally Admits He's 7 Feet Tall". Slam. Archived from the original on January 5, 2017. ^ a b c d e f g h i j k l m "Kevin Durant NBA & ABA Stats". Basketball Reference. Retrieved May 27, 2013. ^ Breen, Matt (2012). "2012 Olympics: Kevin Durant's father cheers from afar after bumpy journey back into his son's life". The Washington Post. Retrieved February 1, 2015. ^ Wharton, David (2007). "Sweet Youth". Los Angeles Times. Retrieved February 1, 2015. ^ Kevin Durant USA Basketball. Retrieved March 15, 2008. ^ Hernández, Arelis (November 25, 2015). "Kevin Durant's new sneakers honor Prince George's. Why is the county offended?". Washington Post. Retrieved June 2, 2017. ^ Kevin Durant on Being 6 ft Tall in Middle School – USA Basketball. ^ a b I wanted to play for the Raptors. Retrieved August 13, 2014. ^ "Kevin Durant Biography". JockBio. Retrieved May 28, 2013. ^ Childhood friends Michael Beasley and Kevin Durant could become Sonics teammates Archived September 16, 2010, at the Wayback Machine. Retrieved May 19, 2008. ^ "UT's Durant: righteous talent SPORTSDAY" (PDF). TexasSports.com. Archived from the original (PDF) on September 26, 2007. Retrieved July 25, 2007. ^ Doyel, Gregg. "Durant commitment national coup for 'Horns, Barnes". CBS Sports. Retrieved June 2, 2013. ^ "2006 McDonald's All-American Game Rosters". Scout.com. Archived from the original on November 4, 2013. Retrieved May 28, 2013. ^ "McDonald's Greatest All-Americans". ESPN. Retrieved May 28, 2013. ^ "Basketball Recruiting: Top Recruits". ScoutHoops.com. Retrieved March 7, 2007. ^ "Prospect Ranking: Final Rivals150 Class of 8181". Rivals.com. May 2, 2006. Retrieved March 7, 2007. ^ "NCAA Division I Basketball Standings – 2006–07". ESPN. Retrieved June 2, 2013. ^ "Young pours in 22 points for USC in blowout of Texas". ESPN. Retrieved July 27, 2013. ^ "Kevin Durant Wins 2007 John R. Wooden Award". woodenaward.com. Retrieved February 10, 2017. ^ "Kevin Durant Wins 2007 Naismith Award". Big 12 Sports. Retrieved February 10, 2017. ^ "Kevin Durant (2007)". texassports.com. Retrieved February 10, 2017. ^ a b "Longhorns' Freshman Durant Named NABC Division I Player of the Year" (PDF) (Press release). National Association of Basketball Coaches. March 21, 2007. Retrieved February 10, 2017. ^ a b "USBWA names Durant, Bennett as player, coach of the year" (Press release). United States Basketball Writers Association. March 27, 2007. Retrieved March 27, 2007. 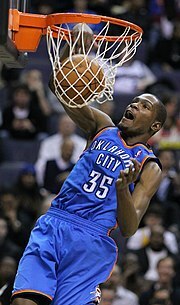 ^ a b "Durant Named Player of the Year" (Press release). Commonwealth Athletic Club of Kentucky. March 27, 2007. Retrieved February 10, 2017. ^ "Durant is first freshman named AP player of year". espn.com. Associated Press. Retrieved February 10, 2017. ^ "Sporting News college basketball Players of the Year, 1943-present". sportingnews.com. Retrieved February 10, 2017. ^ "Kevin Durant". woodenaward.com. Retrieved February 10, 2017. ^ "Durant leaving Texas for NBA". ESPN. Retrieved June 2, 2013. ^ Rosner, Mark (July 3, 2007). "Durant's jersey to be retired". Austin American-Statesman. Archived from the original on July 8, 2007. Retrieved July 3, 2007. ^ "2007 NBA Draft Board". NBA.com. Retrieved May 27, 2013. ^ "Kevin Durant NBA Bio". NBA.com. Archived from the original on January 4, 2014. Retrieved January 8, 2014. ^ "Oklahoma City will be named Thunder, wear blue, orange, yellow". ESPN. Retrieved May 27, 2013. ^ "Russell Westbrook NBA Stats". Basketball Reference. Retrieved February 19, 2015. ^ "Durant goes for 46 as Sophomores again beat Rookies". ESPN. Archived from the original on February 27, 2013. Retrieved May 27, 2013. ^ "Pacers' Granger wins Kia Most Improved Player Award". NBA.com. Archived from the original on October 19, 2014. Retrieved March 2, 2014. ^ "Gasol lifts Lakers past Thunder and into the second round". ESPN. Retrieved May 27, 2013. ^ "Expert predictions: OKC Thunder". ESPN. Retrieved May 27, 2013. ^ Latzke, Jeff. "Durant becomes NBA's youngest scoring champ". Yahoo! Sports. Archived from the original on November 6, 2013. Retrieved May 27, 2013. ^ "Gasol, Bynum dominate inside as Lakers hold off Thunder in Game 1". ESPN. Retrieved May 27, 2013. ^ "2010 NBA Playoffs Summary". Basketball Reference. Retrieved May 27, 2013. ^ Adande, J.A. "Thunder could turn to reign". ESPN. Retrieved May 27, 2013. ^ Kevin Durant [@KDTrey5] (July 7, 2010). "Exstension for 5 more years wit the #thunder....God Is Great, me and my family came a long way...I love yall man forreal, this a blessing!" (Tweet) – via Twitter. ^ "Durant, Thunder agree on extension". ESPN. July 7, 2010. Retrieved June 16, 2011. ^ "2010–11 Scoring leaders: Points per game". National Basketball Association. Archived from the original on August 9, 2013. Retrieved March 14, 2012. ^ "NBA Standings – 2010–11". ESPN. Retrieved May 27, 2013. ^ "2011 NBA Playoffs Summary". Basketball Reference. Retrieved May 27, 2013. ^ Rohde, John. "Oklahoma City Thunder: Performance against Mavericks only Kevin Durant's second 50-plus point game". NewsOK. Retrieved May 27, 2013. ^ Latzke, Jeff (February 19, 2012). "Kevin Durant Scores 51 Points: Thunder Top Nuggets, 124–118 (Video)". Huffington Post Sports. Retrieved May 27, 2013. ^ "Kevin Durant wins third straight NBA scoring title as Kobe Bryant concedes". www.cbssports.com. Retrieved April 27, 2012. ^ "NBA Standings – 2011–12". ESPN. Retrieved May 27, 2013. ^ "nba.com". nba.com. Retrieved April 27, 2012. ^ "2012 NBA Playoffs Summary". Basketball Reference. Retrieved May 27, 2013. ^ "2012 NBA Finals Composite Box Score". Basketball Reference. Retrieved May 27, 2013. ^ Eberts, Wescott. "Kevin Durant joins the exclusive 50–40–90 club". Burnt Orange Nation. Retrieved May 27, 2013. ^ "2012–2013 Conference Regular Season Standings". NBA.com. Retrieved May 27, 2013. ^ a b "2013 NBA Playoffs Summary". Basketball Reference. Retrieved May 27, 2013. ^ "Russell Westbrook to miss playoffs". ESPN. Retrieved May 27, 2013. ^ Lowe, Zach. "Thunder Struck: Russell Westbrook's Injury and What It Means for Oklahoma City". Grantland. Retrieved February 19, 2015. ^ "Kevin Durant's 30-point streak ends at 12 in Thunder's rout of Nets". ESPN. Retrieved February 1, 2014. ^ "Notebook: Thunder 127, Warriors 121". NBA.com. January 17, 2014. Retrieved January 18, 2014. ^ "Durant surpasses Jordan record". ESPN UK. Retrieved July 31, 2016. ^ Stein, Marc (May 6, 2014). "Kevin Durant wins first MVP award". espn.go.com. ^ "Oklahoma City Thunder at Memphis Grizzlies Box Score, April 26, 2014". Basketball Reference. Retrieved July 31, 2016. ^ Lee, Michael. "Kevin Durant remains hungry for NBA title in wake of latest loss, says Thunder's window still open". The Washington Post. Retrieved June 8, 2014. ^ "Kevin Durant's 36 points, 10 boards help Thunder take Griz to Game 7". ESPN. Retrieved June 8, 2014. ^ "Spurs beat Thunder in OT, advance to NBA Finals vs. Heat". CBS Sports. Archived from the original on July 14, 2014. Retrieved June 8, 2014. ^ Brunt, Cliff (October 12, 2014). "Thunder's Durant to miss 6-8 weeks with foot fracture". NBA.com. Turner Sports Interactive, Inc. Associated Press. Retrieved December 20, 2014. ^ Martel, Brett (December 2, 2014). "Durant returns, but Pelicans down Thunder 112-104". NBA.com. Turner Sports Interactive, Inc. Retrieved February 8, 2015. ^ Young, Royce (December 19, 2014). "Kevin Durant (ankle) day to day". ESPN. ESPN Internet Ventures. Retrieved February 8, 2015. ^ Sellars, Tony (December 31, 2014). "Durant, Thunder beat Suns in OT". NBA.com. Turner Sports Interactive, Inc. Retrieved April 8, 2015. ^ Evans, Murray (February 6, 2015). "Davis has 41, hits 3 at buzzer to lift Pelicans over Thunder". NBA.com. Turner Sports Interactive, Inc. Retrieved February 8, 2015. ^ "Kevin Durant Injury Update". NBA.com. February 22, 2015. Retrieved February 22, 2015. ^ "Kevin Durant Injury Update". NBA.com. March 27, 2015. Retrieved March 27, 2015. ^ Ogden, Rob (October 30, 2015). "Russell Westbrook, Kevin Durant are first duo to each score 40 since Michael Jordan and Scottie Pippen". SunTimes.com. Archived from the original on November 17, 2015. ^ Kramer, Daniel (October 31, 2015). "Kevin Durant and Russell Westbrook Combine for 91 Points in 2OT Win vs. Magic". bleacherreport.com. Retrieved March 15, 2018. ^ "Westbrook rallies Thunder past Nuggets, 122-112". NBA.com. December 27, 2015. Retrieved March 15, 2018. ^ a b c "2015-16 NBA Season Summary". Basketball Reference. Retrieved February 19, 2017. ^ "Dallas beats Oklahoma City 85-84, ties series 1-1". NBA.com. April 18, 2016. Retrieved April 18, 2016. ^ "Durant scores 41 points, Thunder beat Spurs to tie series". NBA.com. May 8, 2016. Retrieved May 8, 2016. ^ "Stephen Curry, Warriors back to NBA Finals after finishing off OKC". ESPN. Retrieved February 19, 2017. ^ Durant, Kevin (July 4, 2016). "My Next Chapter". The Players' Tribune. Retrieved July 4, 2016. ^ Gregory, Sean (July 4, 2016). "Why Kevin Durant's Decision Is Worth Cheering For". Time. Retrieved July 4, 2016. ^ Zillgitt, Jeff (July 4, 2016). "How Kevin Durant's decision to join Warriors affects the NBA". USA Today. Retrieved July 4, 2016. ^ Leonard, Pat (July 7, 2016). "Kevin Durant's move to leave Thunder for Warriors is worse than LeBron James' 'Decision': That's Debatable". New York Daily News. Retrieved July 7, 2016. ^ Maloney, Jack (September 19, 2017). "Kevin Durant says he initially regretted his decision to join the Warriors". CBS Sports. Retrieved February 4, 2018. ^ "Durant in new documentary: Bullies say 'I took the easy way out'". NBC Sports. July 11, 2017. Retrieved May 4, 2018. ^ "Warriors Sign Free Agent Forward Kevin Durant". NBA.com. July 7, 2016. Retrieved July 10, 2016. ^ "Kevin Durant to sign with Warriors". ESPN. July 4, 2016. Retrieved July 7, 2016. ^ McCauley, Janie (July 7, 2016). "Splash! Kevin Durant finalizes two-year deal with Warriors". Yahoo! Sports. Retrieved July 7, 2016. ^ Golliver, Ben (July 4, 2016). "Golden Decision: Kevin Durant shakes up the NBA with move to the Warriors". Sports Illustrated. Retrieved February 4, 2018. ^ "Leonard, Spurs spoil Durant's Warriors debut with blowout". ESPN.com. October 25, 2016. Retrieved October 26, 2016. ^ "Warriors eventually find flow without Green, beat Minnesota". ESPN.com. November 26, 2016. Retrieved November 27, 2016. ^ "Durant leads Warriors to win in return to Oklahoma City". ESPN.com. February 11, 2017. Retrieved February 12, 2017. ^ "Kevin Durant Injury Update". NBA.com. March 1, 2017. Retrieved March 1, 2017. ^ "Durant shines in return from 19-game absence, knee injury". ESPN.com. April 8, 2017. Retrieved April 8, 2017. ^ "2016-17 NBA Standings". Basketball-Reference.com. Retrieved November 4, 2017. ^ "Curry's 36 points leads Warriors to sweep Spurs, 129-115". ESPN.com. May 22, 2017. Retrieved May 22, 2017. ^ "Kevin Durant drops 38 as Warriors rout Cavs in Game 1 of Finals". ESPN.com. June 1, 2017. Retrieved June 1, 2017. ^ "Durant's dagger 3 lifts Warriors over Cavs in Game 3". ESPN.com. June 7, 2017. Retrieved June 8, 2017. ^ "Cleveland Cavaliers at Golden State Warriors Box Score, June 12, 2017". June 12, 2017. Retrieved February 4, 2018. ^ Devine, Dan (June 13, 2017). "Kevin Durant is your 2017 NBA Finals MVP". Yahoo.com. Retrieved June 13, 2017. ^ Blinebury, Fran (June 13, 2017). "Golden State Warriors forward Kevin Durant claims Finals MVP". NBA.com. Retrieved June 13, 2017. ^ Nathan, Alec (June 30, 2017). "Kevin Durant Reportedly Declines Warriors Contract Option, Expected to Re-Sign". BleacherReport.com. Retrieved July 21, 2017. ^ Winfield, Kristian (July 3, 2017). "Kevin Durant will take nearly $7 million pay cut to keep the Warriors together". SBNation.com. Retrieved July 21, 2017. ^ "Lou Williams scores career-high 50, Clippers beat Warriors". ESPN.com. January 10, 2018. Retrieved January 10, 2018. ^ "Stephen Curry, Warriors use big second half to beat Knicks". ESPN.com. January 23, 2018. Retrieved January 24, 2018. ^ "Lillard has 44, Blazers overcome Durant's 50, beat Warriors". ESPN.com. February 14, 2018. Retrieved February 15, 2018. ^ "Injured Warriors play short, don't have enough against Kings". ESPN.com. March 16, 2018. Retrieved March 16, 2018. ^ "After Curry goes down, Durant rallies Warriors past Spurs". ESPN.com. March 8, 2018. Retrieved March 9, 2018. ^ "Durant's 37 lead Warriors over Rockets 119-106". ESPN.com. May 14, 2018. Retrieved May 14, 2018. ^ Kevin Durant is reverting to old habits as Warriors get pushed to brink of elimination, Tim (May 25, 2018). "Kevin Durant is reverting to old habits as Warriors get pushed to brink of elimination". Chicago Tribune. Retrieved August 4, 2018. ^ "Durant has 43, Warriors take 3-0 NBA Finals lead over Cavs". ESPN.com. June 6, 2018. Retrieved June 6, 2018. ^ "Durant Carries Warriors Over Cavs in Game 3". NBA.com. June 6, 2018. Retrieved June 6, 2018. ^ "Dub Dynasty: Warriors sweep Cavaliers for second straight title". ESPN.com. June 8, 2018. Retrieved June 9, 2018. ^ "Warriors Re-sign Forward Kevin Durant". NBA.com. July 7, 2018. Retrieved July 7, 2018. ^ a b "Leonard scores 37, Raptors beat Warriors 131-128 in OT". ESPN.com. November 29, 2018. Retrieved November 29, 2018. ^ "Curry injured, Bucks snap Warriors' 8-game win streak". ESPN.com. November 8, 2018. Retrieved November 29, 2018. ^ Tomasson, Chris (February 17, 2007). "Dantley given Hall of Fame support". Rocky Mountain News. Archived from the original on February 19, 2007. Retrieved March 7, 2007. Colangelo said he plans to invite University of Texas player Kevin Durant to Team USA training camp this summer. ^ McMenamin, Dave (July 25, 2007). "Team USA: Durant Better Than Advertised". NBA.com. Archived from the original on August 8, 2007. Retrieved July 31, 2007. ^ a b Mahoney, Brian (August 26, 2007). "Durant, Collison dropped from U.S. team". USA Today. Retrieved August 29, 2007. ^ Sheridan, Chris (August 2, 2010). "Kevin Durant: The Reluctant Face of Team USA". ESPN. Retrieved December 12, 2010. ^ "USA – Durant Named Tournament MVP" (Press release). FIBA. September 12, 2010. Archived from the original on March 25, 2012. Retrieved September 12, 2010. ^ a b c "Kevin Durant". USA Basketball. Retrieved January 29, 2014. ^ "Updates from the London 2012 closing ceremonies –". Usatoday.com. December 8, 2012. Retrieved July 4, 2013. ^ Stein, Marc. "Instant Analysis: Team USA 107, Spain 100". ESPN. Retrieved January 29, 2014. ^ Freeman, Eric. "Kevin Durant totally dropped out of Team USA because of the Paul George injury". Yahoo! Sports. Retrieved July 31, 2016. ^ "USA Men's National Team". USA Basketball. Retrieved July 31, 2016. ^ "Carmelo Anthony And Kevin Durant Share 2016 USA Basketball Male Athlete Of The Year Award". USA Basketball. December 7, 2016. Retrieved December 7, 2016. ^ Golliver, Ben (February 8, 2016). "Top 20 NBA players of last 20 years". Sports Illustrated. Retrieved March 10, 2018. ^ "LeBron James named 2009–10 NBA MVP presented by Kia". NBA.com. Archived from the original on May 3, 2013. Retrieved July 28, 2013. ^ Reynolds, Tim. "LeBron James wins 3rd NBA MVP award". Yahoo! News. Retrieved July 28, 2013. ^ "James wins 4th Kia MVP award in near unanimous vote". NBA.com. Retrieved July 28, 2013. ^ Golliver, Ben. "Kevin Durant sick of second, working for first with help of advanced stats". The Point Forward. Archived from the original on October 25, 2013. Retrieved November 3, 2013. ^ a b Hollinger, John. "OKC Thunder: 2012–13 roster". ESPN Insider. Retrieved November 3, 2013. ^ Babb, Steven (April 17, 2014). "Kevin Durant Enters Michael Jordan Territory with 4th Scoring Title in 5 Years". Bleacher Report. Retrieved March 10, 2018. ^ a b c Taylor, Ben (March 5, 2018). "Backpicks GOAT: #26 Kevin Durant". Back Picks. Retrieved March 10, 2018. ^ Lowe, Zach. "The Not Quite Midseason Awards". Grantland. Retrieved May 27, 2013. ^ a b Pelton, Kevin. "Okla. City Thunder: 2013–14 roster". ESPN Insider. Retrieved November 3, 2013. ^ "Kevin Durant Draft Express Profile". Draft Express Profile. Retrieved November 3, 2013. ^ Young, Royce. "John Hollinger on Kevin Durant (and others)". Daily Thunder. Archived from the original on October 16, 2014. Retrieved November 3, 2013. ^ Pelton, Kevin. "Roy Hibbert for Defensive POY". ESPN Insider. Retrieved April 12, 2014. ^ Tjarks, Jonathan (February 13, 2018). "Kevin Durant's Defensive Player of the Year Candidacy Isn't Perfect, but It's Real". The Ringer. Retrieved March 10, 2018. ^ Petski, Denise (February 3, 2016). "Lifetime Sets Movie About Kevin Durant's Mom; Queen Latifah Produces, Cassandra Freeman Stars". ^ Young, Royce. "Kevin Durant on his hobbies, Twitter and who could beat him 1-on-1". Daily Thunder. Archived from the original on January 3, 2013. Retrieved June 2, 2013. ^ a b "Kevin Durant". ^ "Kevin Durant Is Not Ashamed Of His "Business" Tats". ^ "Durant's ink shows who's got his back". ^ Freeman, Eric. "Kevin Durant is selling his house in Oklahoma City for a mere $1.95 million". Yahoo! Sports. Retrieved March 2, 2014. ^ Kenny, Michael (December 15, 2013). "Kevin Durant's new restaurant is changing the game". The Norman Transcript. Archived from the original on March 3, 2014. ^ "Kevin Durant, Monica Wright engaged". ESPN. July 8, 2013. Retrieved September 20, 2013. ^ Mandell, Nina (February 18, 2015). "Kevin Durant broke off his engagement because he 'didn't love her the right way'". USA Today. ^ Freeman, Eric (February 7, 2016). "Kevin Durant works as credentialed photographer at Super Bowl 50". Yahoo! Sports. Retrieved July 5, 2016. ^ Durant, Kevin (February 8, 2016). "My View From Super Bowl 50". The Players' Tribune. Retrieved July 5, 2016. ^ Kevin Durant splits from longtime agent. Retrieved February 19, 2012. ^ a b Amick, Sam (June 7, 2013). "Kevin Durant leaves agent, may work with Jay-Z". USA Today. Retrieved June 8, 2013. ^ Darren Rovell (June 24, 2013). "Jay-Z's agency lands Kevin Durant". ESPN. Retrieved June 25, 2013. ^ a b Badenhausen, Kurt. "Kevin Durant Is On The Verge Of Global Stardom". Forbes. Retrieved June 2, 2013. ^ "Thunderstruck: Why was the Thunder's Kevin Durant chosen for a movie?". NewsOK. Retrieved June 2, 2013. ^ Golliver, Ben. "LeBron James passes Kobe Bryant on SI's 'Fortunate 50′ highest-earning athletes list". Sports Illustrated. Archived from the original on June 7, 2013. Retrieved June 2, 2013. ^ "The NBA's Top-Selling Jerseys". Sports Illustrated. Retrieved March 13, 2014. ^ "Curry starts in first All-Star Game; LeBron top vote-getter". NBA.com. Retrieved March 2, 2014. ^ Astramskas, David. "Commercial: Kevin Durant is the "nicest guy in the NBA" & wanted for dunking". Ball Is Life. Retrieved June 2, 2013. ^ Young, Royce. "Kevin Durant is, in fact, very nice". CBS Sports. Retrieved March 2, 2014. ^ Broussard, Chris. "Strong and Kind movement". ESPN. Retrieved March 2, 2014. ^ Bontemps, Tim (July 26, 2018). "The contentious relationship between Kevin Durant and NBA Twitter continues". The Washington Post. Retrieved August 4, 2018. ^ Mansfield, Aaron (August 2, 2018). "Kevin Durant on Why He Was a 'Phony' in Oklahoma City". Retrieved August 4, 2018. ^ Xchange, Sports (May 21, 2013). "Durant donates $1 million to tornado victims". Chicago Tribune. Retrieved May 21, 2013. ^ Devine, Dan. "Kevin Durant taps Nike to donate $1M in products, sneaker profits to Oklahoma tornado relief". Yahoo! Sports. Retrieved June 2, 2013. ^ "Kevin Durant and P'Tones Records Apply for the Pepsi Refresh Grant". Kevindurant35.com. Archived from the original on July 13, 2011. Retrieved June 16, 2011. ^ Williams, Alex (February 18, 2017). "How Kevin Durant Became Silicon Valley's Hottest Start-up". The New York Times. Retrieved April 26, 2017. ^ a b "Kevin Durant – YouTube about page". Kevin Durant. YouTube. Retrieved April 26, 2017. ^ a b Burns, Mark J. (April 17, 2017). "Kevin Durant creates YouTube channel to show 'different side'". Sports Illustrated. Retrieved April 26, 2017. ^ "NBA Superstar Kevin Durant Teams With Brian Grazer On Apple Scripted Series". Deadline Hollywood. February 13, 2018. Retrieved February 13, 2018. ^ Brown, Chip (March 22, 2007). "Durant named NABC player of the year". Dallas Morning News. Archived from the original on September 30, 2007. Retrieved March 22, 2007. ^ "Durant is first freshman named AP player of year". ESPN. Associated Press. March 31, 2007. Retrieved February 25, 2012. ^ Brown, Chip (March 27, 2007). "Durant, Law on All-America team". Dallas Morning News. Archived from the original on September 27, 2007. Retrieved March 27, 2007. ^ "John R. Wooden Award announces the 2006–07 All-American Team". John R. Wooden Award. March 27, 2007. Retrieved March 28, 2007. Wikimedia Commons has media related to Kevin Durant.